The Extensive Reading Foundation (ERF), an unaffiliated, not-for profit organization that supports and promotes extensive reading in language education, takes pleasure in announcing the winners of the 14th Annual Language Learner Literature Award for books published in 2017. An international jury chose the winning book in six categories, taking into account the Internet votes and comments of students and teachers around the world. The judges’ comment is followed by reactions from readers of the book. All books mentioned on this page can be ordered online from the independent Cambridge International Book Centre. In Japan, the finalists can be ordered thorough the ETJ Book Service: http://www.etjbookservice.com/extensive-reading-foundation/. On-line voter’s comment: It was interesting and nicely illustrated. Once you flip through it, you’ll definitely want to read it. Jurors’ comment: The legendary historical tale of Hua Mulan, a young Chinese woman who took her father’s place in the army and became a war hero, comes alive in this reader. 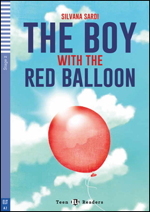 The story is well written with an interesting plot which will inspire young readers to continue reading to the end. It invites children to think about devotion to their parents, as well as making sacrifices for their fellow country people. 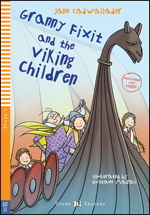 The language is easy to understand, and the illustrations, text and design are appropriate for the age group. 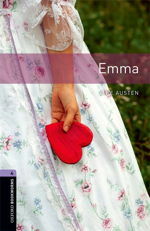 Overall, it is a vivid and moving adaptation of a timeless classic to be enjoyed by all who read it! 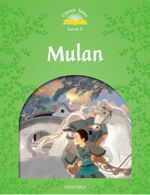 On-line voter’s comment: The story of Mulan was very interesting. The pictures are beautiful and yet self-explanatory. My students loved the story and were inspired by the bravery of Mulan. Jurors’ comment: Very nice story, intriguing and involving. Clear simple language. On-line voter’s comment: It is clearly a story made for teenagers and for students who want to practice their English and bring it to a better level. It is a well written story, with suspense and really good exercises for someone who is not interested in just reading a book. 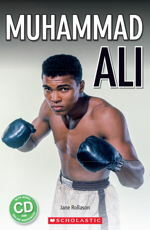 Jurors’ comment: This book tells about the life of the world’s greatest boxer, Muhammad Ali. Being an African-American did not stop Ali from making a great life achievement. He jeopardized his boxing career when he refused to fight in the Vietnam War. Although Ali had lost the boxer’s golden period and he had to crawl to reach the top, he was able to get his career back and stay on top for quite a long time. His struggles and strong desire are inspiring and can be a valuable lesson to follow. The original pictures help the readers to visualize more about Ali’s fame. On-line voter’s comment: The reader contains a lot of information but presented in a simple way. It keeps a quick pace and the story telling is good even though it is a non-fiction book. It touches on several sensitive topics that would make it ideal for a post reading discussion. On-line voters’ comment: In my opinion, this book is kind of the type of book that I would be interested in. The introduction behind the book is pretty good, it could make girls be easily attracted. I do not especially like books with lots of adventurous details or illustrating some scary scenes, thus, this book is really fits my taste. About Emma, the more I see a girl doing something, I cannot really get any very sad or happy point which does help a lot to make book become more interesting. Jurors’ comment:The story is simple but it gives concrete examples of understanding the concept of hot and cold. Activities are suitable to very young learners. Some of the activities can be personalized. There are a lot of repetitions and exercises to learn the words. Illustrations are bright and catchy which also support the content. Jurors’ comment:This reader combines non-fiction and fictional stylist elements to tell the everyday true story of a girl from Uganda called Nyangoma. Through photographs and illustrations, which are combined with simple but evocative text, we learn about her daily life including food, school, friends and toys. She even encounters a snake on her journey to school! Children can also compare the story to their own everyday lives and culture in their country. The book was created in association with Adelante Africa, an NGO which supports schools and communities in Uganda. In short, this fun hybrid non-fiction reader is both engaging and meaningful. Kids, as well as the parents or teachers they read it with, will all love it! Jurors’ comment: This fantasy style fictional story tells the story of Max, who is in an ice-hockey team called the Tigers. He and his robot Clunk end up encountering real tigers on an adventure in the snow. The story will stimulate children’s critical thinking as they think about how they would solve the problems Max and Clunk experience. The book has a conversational style rather than being overly descriptive. It also has delightful illustrations which bring the characters alive. The size of the book and typeface are appropriate for the level. In summary, the book is an amusing and stimulating tale for young readers starting out on their English learning journey. Jurors’ comment: Cinderella is a tale that has been retold many times, but it does not lose it magic. There are no surprising ‘moments’ however there are special touches such as the musical spell ‘Wishes and dreams…’. The layout and production of the text is also of a high quality, so a learner won’t feel overwhelmed by the amount of text on the page. The illustrations are a plus and compliment the text. The story is clear, easy to understand, and pitched at the correct level for beginner ELL’s. Jurors’ comment: Aesop’s fables are classics and this retelling of the tale is rich and clearly carries across the moral of the original tale. The language used for this tale is clear and easy to follow. The beautiful illustrations richly compliment the story. The book is well laid out with the use of margins and the spacing of the text. Jurors’ comment: It is a very good thriller about a teen called Jim who goes to Central America to visit and get to know his uncle. The story is very engaging with lots of adventure, mystery, travels, as well as environmental topics, and discovering cultures. The pictures are beautiful and help readers understand the story more easily. Jurors’ comment: The story of King Arthur, Merlin and the Knights of the Round Table is a very exciting one, that will take you to battlefields, balls and important meetings. Reading this book will help you understand an important part of European culture. The illustrations are also full of energy and beautifully done. Jurors’ comment: A Single Shot is a page-turning action thriller that leaves you guessing till the very end about the protagonist, why he escaped from the police, who he is, and what the title refers to. The illustrations help explain the story and the action takes us across the channel where the teenage heroes find resolution and Morrow finds redemption. Jurors’ comment: James Joyce has finally made it into the Language Learner Literature library and these versions of the Dubliners stories are excellent. Some of the text seems to be taken straight from the original and certainly the spirit of all the stories remains intact. New vocabulary and cultural references are explained at the bottom of the page and colorful artwork helps to set the scene. However, the abundance of activities placed between the chapters might contradict the nature of extensive reading practices. Yet, overall it is a well-written and a well-organized book. Jurors’ comment: A poetic and impressive retelling of an old classic. A well written and easy to follow text with a bounty of social, cultural and temporal information that L2 readers would find informative and fairly entertaining. The activities seem well proportioned to the overall text, and offer the learner some valuable opportunity to think deeply about the text as well as beyond the text itself. The color illustrations are simple, yet reasonably appealing for a 21st-century reader. The ERF thanks the publishers who nominated books, the members of the Award Jury, and all the students and teachers who evaluated this year’s finalists. The nomination and voting procedures for the 2017 Language Learner Literature Award will be posted on the ERF website (www.erfoundation.org) later this year.